Written by: Sara Lukinson, Michael Stevens, and George Stevens, Jr. The Honors recipients recognized for their lifetime contributions to American culture through the performing arts— whether in dance, music, theater, opera, motion pictures or television—are selected by the Kennedy Center's Board of Trustees. The primary criterion in the selection process is excellence. Recipients honored at the 31st annual national celebration of the arts—which were announced in September 2008—were: actor Morgan Freeman, singer George Jones, director, singer, actress, composer and producer Barbra Streisand, choreographer Twyla Tharp, and musicians Pete Townshend and Roger Daltrey of The Who. The first weekend of December was filled with honors activities. First, The Boeing Company (the exclusive underwriter of the 2008 Kennedy Center Honors Gala and weekend of events) hosted an honorees luncheon, which Barbra Streisand attended on Saturday afternoon, December 6. (Photo, above): Kennedy Center 2008 Honorees. Top row from left: Roger Daltrey, Pete Townshend, George Jones. Bottom row: Twyla Tharp, Morgan Freeman, and Barbra Streisand. This group photo was taken after the State Department Dinner for the Kennedy Center Honors gala Saturday, Dec. 6, 2008 at the State Department in Washington. On December 7, the President and Mrs. Bush received the Honorees and members of the Artists Committee, who nominated them, along with the Kennedy Center Board of Trustees at the White House prior to the gala performance. After the 2008 Kennedy Center Honors Gala, the evening concluded with a supper dance in the Grand Foyer. The live presentation took place in the Kennedy Center Opera House. The evening was videotaped for airing on CBS on December 30, 2008. The live show differed from the telecast—several artists' speeches and musical numbers were either eliminated completely on television, or shortened. 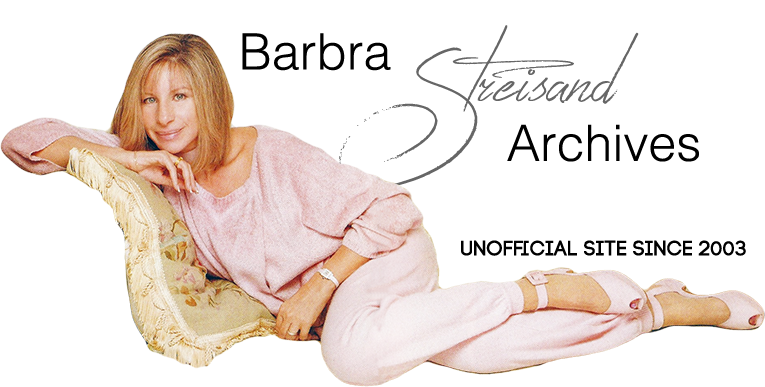 Streisand's presentation, for the most part, was aired with hardly any cuts. At the very beginning of the live show, video of Streisand and Bush greeting each other at the White House with a kiss was shown and the audience in the Opera House giggled ... a little awkward, considering Bush and Streisand were sitting in the first tier watching the video too! (This segment did not air on CBS). Streisand (who was honored last, following George Jones) was fêted with a speech by Queen Latifah. Streisand then received a standing ovation from the Kennedy Center audience. Glenn Close came out and made a nice speech about playing Margarethe Cammermeyer in the 1995 television movie that Barbra produced, Serving in Silence. Close spoke about gays and lesbians and brought a semi-political tone to the tribute, considering George Bush was sitting in the audience. (Close's speech was cut from the CBS broadcast. Only her closing comments were included). Next, Ne-Yo (30 year-old pop and R&B singer-songwriter), appeared onstage with male backup dancers and performed a dynamic version of “Lover, Come Back to Me”, choreographed by Rob Ashford. He tipped his hat at Miss Streisand at song's end. At this point during the live show, there was a hangup and the show stopped for about 2 minutes. (This was, of course, edited out for the TV special). Finally, Caroline Kennedy took her spot on the stage and introduced “Somewhere”, sung by Kelli O'Hara (Broadway's South Pacific) and Nathan Gunn (baritone, recitalist, and recording star). Streisand seemed genuinely moved by the choir. The audience stood for Streisand one last time and the evening concluded. Streisand and husband James Brolin attended a dinner/reception after the show. Some of Barbra's famous friends attended, including Marilyn and Alan Bergman, Donna Karan, and Marty Erlichman and his wife. (Above): Streisand and James Brolin say hello to Beyonce at the reception following the show. During the White House ceremony, the President described each honorees attributes. After he listed mine, he added, “She’s also been known to speak her mind,” to which the audience first laughed and then applauded. I genuinely thought he was very funny and very gracious. During the Kennedy Center Honors, President Bush gave me his signature wink (which he must have passed on to Sarah Palin) and mouthed, “We showed ‘em.” I guess in some small way, he and I proved that we could agree to disagree, and, for that weekend, art transcended politics. The Kennedy Center Honors, after it aired on CBS, achieved the 13th place on the Nielsen ratings with 10.51 million viewers. It's interesting to note that the second hour of the special—when Streisand's segment aired—garnered higher ratings than the first hour (10.75 million versus 10.15 million in the first hour). Special thanks to Robin Lipman!